Best suited Cars- Ford Figo and Ford Ecosport. Though you can choose one according to your convenience. The splendour and grandeur of Mysore still emits the reign of the Vijayanagar Empire. Mysore has always been a prominent location for the rich and powerful. From being the capital of Vijayanagar Empire to the time of Hider Ali, succeeding by Tipu Sultan, finally being a princely state administered by the British. The place is known for its glimmer and glory, maybe that stands for its reason to be the cleanest city in India. 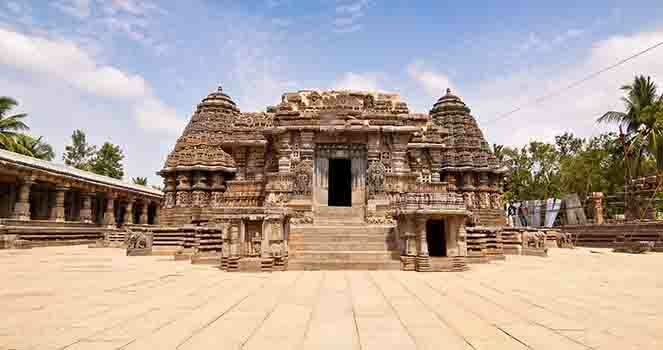 The place is even vivid spiritually as its relevance with Indian Mythology 'the land of Mahishasura'. Since the place has so much of historic and religious significance, it is a famous tourist attraction of the south. If we shift our attention from the massive illuming palaces, there is a lot to be explored in the city. The best and most convenient way to discover the city is by renting a Self-drive car by Volercars. No unnecessary waiting for drivers, visiting random nooks and corners suggested by friends and family, not worrying about being time bound. Dive though the city like the self-drive all through Mysore. In case you are already in the city, start your day with a morning drive to the Karanji Lake. Chances are that you may find a pair of white swans swimming or a muster of peacocks. You may spot some rare birds as the Ranganathittu Bird Sanctuary is just adjacent to the lake. You might get lucky in this case if you are visiting the place on December or January. What would be absolutely apt for the next stop is Hotel Mylari, for the softest and yummiest dosas with chutney with a glass of filter coffee. That would be the best start to your Mysore trip. For the spiritual souls out there, you could pay a visit to the Datta Peetham, a spiritual ashram, with religious atmosphere, an Ayurveda hospital attached to the premises and the best Bonsai Garden. A must visit is the Maharaja's Palace. The palace is a treat to a spectator's eyes. Its intricate details of ivory work ceilings inside, marble figurines and rosewood doors is what would makes jaws drop. The palace is lit up by 100,000 bulbs in the evening on a Sunday or a national holiday. The scene is magnificent and it is done on all 10 days of Dasara (a prominent and well known festival). You can retire at any hotel or dorm that suits your budget, and then leave early next morning for the Chamundeshwari Temple on the top of Chamundi Hill. Just outside the city. You better leave early or prepare yourself for a long queue of devotees. Till you wait for your turn to eater the temple, look around and adore the panoramic view of the entire city. The cool wind at the hill top will energise your senses. After getting down you might feel a little hungry so head straight up to Mahesh Prasad for authentic south Indian breakfast. Plan the rest of the day in there, whether you want to visit the Sand Museum or the Mysore zoo that was establishes in 1892, making it one of the oldest zoos in the world or the St. Philomena's Church. Save the evening for peek at the Cauvery Handicraft Emporium, for fragrant Incense sticks, Chenapatna Dolls and Wooden Toys, Traditional Deck of playing cards. Stroll the local markets for Tradition Mysore Silk sarees and do not forget to pack some Mysore Pak. You can never have enough, if you start eating. There is a lot that attracts tourists to Mysore, find yours and way will lead you to the right place. Call it the 'City of Palaces' or 'Sandalwood City' or even 'City of Yoga', the place will never disappoint anyone. A quick tip would be to initiate a Chat with the localities to know things that no google will tell you. If you want to explore a place, get to know the people.